Today's subject is a bit delayed, the last week I was busy with werewolves and Spartans, but I have to tell a story about secret societies. 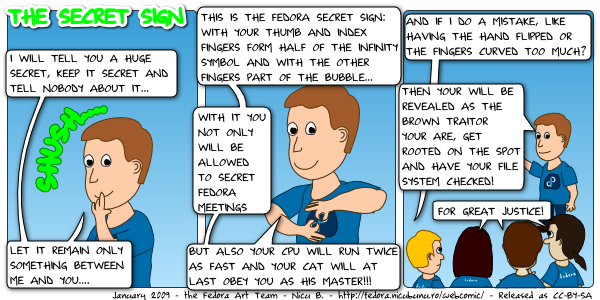 It is unrelated to the to recent talks on Planet Fedora, the source is a cool photo from Mo's FUDCon coverage. Now in the following days I have a decision to make for the next issue: come with a fresh subject or continue to beat the poor horse some more and bore my audience with yet another bad joke involving Spartans. My computer already runs twice as fast as it does. My cat knows about 50 words, can say several, understands pointing and hand gestures, and will follow me around the house. Some people say i have a feline shadow. But i never once have made that symbol. Damn these non-opposable paws!